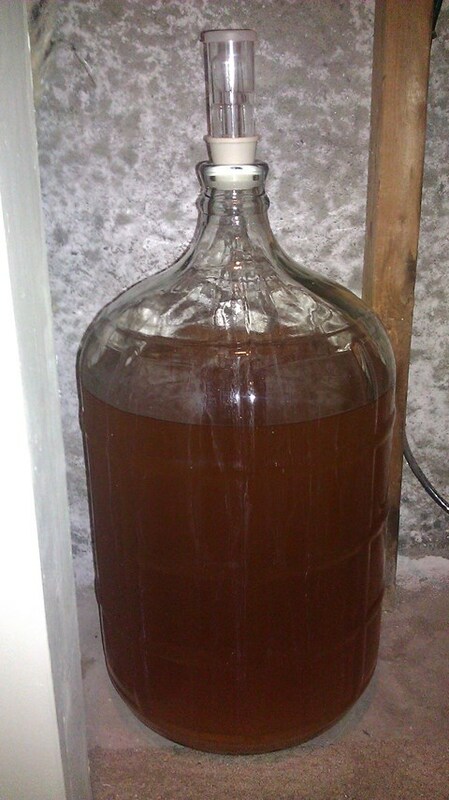 The cider I made back in October has been conditioning in my basements for a few months now. As you may be able to see, it isn’t super clear but that’s all I may get with this batch. When I take samples out to look at in a glass, it appears much lighter and clearer. With the time that elapsed and the clarity that I see in the samples, it’s time to bottle this cider. I listened to the Brewing Network podcast with Drew Beechum and one of the big points I took away from it was that cider is not done when fermentation is over. Making an excellent cider is what you do with it after the yeast have done their thing. In the past, I have experimented with backsweetening using apple concentrate, sugar, or a non-fermentable sweetener like aspartame (yuck). I have not added sorbate to hinder yeast growth so it’s more of a tight rope act of letting the yeast ferment some of the sugar to carbonate and then cold crash/drink quickly the cider. In other times, my yeast have been too pooped to carbonate and just adding a little bit of sugar or apple juice at bottling has been enough to even out the flavor. I learned about a malolactic fermentation which is brought on by adding bacteria to the cider which will convert the malic acid to lactic acid. From my tasting of what I have in the carboy right now, tartness is not an issue. What is an issue may be figuring out how to make this cider stand out. The cider is fine and all but I am not sure it’s great. It might be worth drawing out another small sample and have another person weigh in with their ideas. With the English ale yeast that I used, it may be good to go as is. Because of the long conditioning time, a champagne yeast will be added at bottle with just a little sugar for carbonation. I will update you on the findings and the plan. Pssst! Check out how this cider came out by watching our tasting video. John, I was wondering if you felt that backsweetening was necessary. I admittedly have never made cider before, but being from Connecticut and having so many orchards, I wanted to give it a try this apple season. Interested to see how yours turns out. I don’t think backsweetening is necessary. If you are happy with the taste of your cider after it is finished fermenting, then you don’t have to backsweeten it. If it is too dry for your liking, then by all means – sweeten it up. Definitely make a cider this year. It is much easier than brewing beer.